Nostalgia isn’t what it used to be! It is (nearly) always good to see an old friend. Revival gigs by rock stars and movies starring old, well-loved actors, always attract huge audiences. So, it is nice to welcome back to the fold…….the interest rate differential. Pre-2008 G20 economies were all heading in different directions pulled this way and that by any number of diverse factors. In fact, G7 economies had “pet” drivers that made them unique. In the U.S. it was (and still is) employment, in the U.K., house prices and the Eurozone was consumed (driven by Germany) by inflation. Imagine pre-1999 where the original twelve Eurozone members had their own monetary policy and interest rate! 2008 and the global financial crisis changed all that. Interest rates were cut to the bone everywhere to provide a basis to avoid disaster. 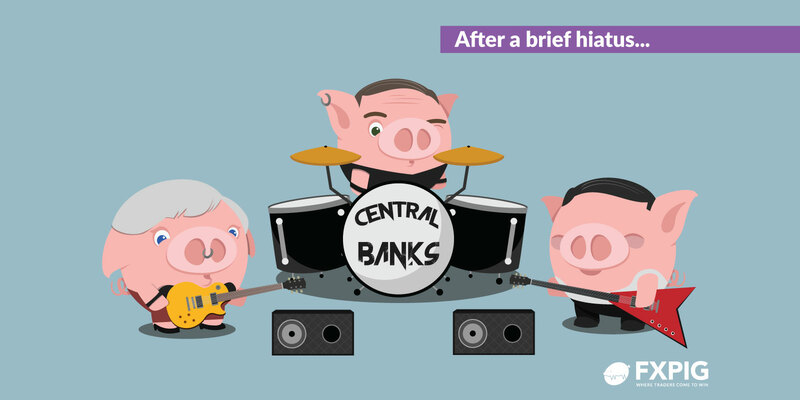 The Fed, BoE and ECB all put in place, in various forms, quantitative easing programmes. These were basically injections of liquidity which economists saw as “financial Armageddon”. Well, to date, all predictions of Armageddon no matter who from, how old or on what basis, have proved to be false. Although the Swiss National Bank gave us a pretty good vision of what to expect in January 2015 when it took the peg away! What? You didn’t receive the memo? We are now starting to see the re-emergence of the interest rate differential as a potential driver of currency markets. Traders, particularly younger traders, should have received extra guidance in how to react. However, a lot of traders clearly “didn’t get the memo” about how a widening interest rate differential is supposed to be supportive of the currency and the dollar index has plunged by close to 10% despite two further hikes. Now the other two central banks who toyed with quantitative easing alchemy are considering rate hikes. In the U.K. the picture is clouded somewhat by Brexit. Until this week, inflation had been rising seemingly out of control, but the latest data showed a fall in June from 2.9% to 2.6% easing the calls for a hike. The ECB insists that the need for a rate hike is some way in the future as growth is patchy across the region although withdrawal of emergency assistance is slated to be discussed in the Autumn. Brexit? We have ages yet! My brief to look at the markets from a slightly off the wall angle has led me to decide that I couldn’t leave without mentioning Brexit. The press conference where Michel Barnier and David Davis outlined what progress has been made so far was, for me, significant for what wasn’t said more than for what was. Barnier is clearly angry that the U.K. doesn’t seem to be taking things seriously enough. He is adopting a very Teutonic stance, leaving his sense of humour at the door. David Davis on the other hand has an air of diffidence seemingly believing that “it will all sort itself out in the end”. Barnier is stiff backed, you almost expect him to click his heels and salute, whereas Davis slouches over his lectern fiddling with his earpiece. He doesn’t seem to know what language Barnier is speaking which is just as well as he constantly switches between English and French. It is slated that face to face meetings between the negotiators will take place for four days a month with a press conference at the end to advise on progress. That means we have 76 days before March 30, 2019 when the lights go out. I don’t know about you but for me that seems an awfully brief time.